In this post I shall explain a bit of physics behind part 1. As a general rule, the maximum power transfer from an active device like an amplifier to an external device like a speaker occurs when the impedance of the external device matches that of the source. That optimum power is 50% of the total power when the impedance of the amplifier is matched to that of the speaker. Improper impedance matching can lead to excessive power use, distortion, and noise problems. Note that it is safer in terms of total power to go to higher impedance speakers (series speakers), but more typical practice is to put speakers in parallel, lowering the impedance. 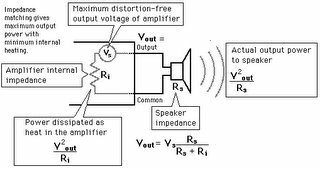 The maximum power transfer from an active device like a microphone to an amplifier occurs when the impedance of amplifier input matches that of the source device. That optimum power is 50% of the total power when the impedances match. If a high impedance microphone (50,000 ohms) is connected directly to a low impedance input (600 ohms), it will deliver only about 5% of the power you get if impedance matched (13 dB less signal). In addition, it is more subject to external interference such as 60 Hz hum. If a low impedance microphone (600 ohms) is connected directly to a high impedance input (50000 ohms), it will likewise deliver only about 5% of the power you would get when impedance matched (a 13 dB loss). One of the obvious ways to get more amplified sound to the listener is to move the loudspeaker closer to the listener. The amount of anticipated improvement in the potential acoustic gain can be modeled for the simplified amplification system. As a practical matter in larger auditoriums, this means using additional speakers which are closer to the listener to add to the sound from a main speaker cluster. A problem which arises is that the signal from the amplifier to the distant speaker travels at the speed of light whereas the direct sound from the source travels at the speed of sound. A sound image problem results from the fact that the sound from the nearby speaker reaches the listener before the sound from the visible source in the front of the auditorium - your ear locates a sound partly by time of arrival and therefore hears it coming from the speaker. The location conflict between your ears and eyes can be disconcerting. This is typically overcome by using a digital delay for the sound signal going to the distant speakers.